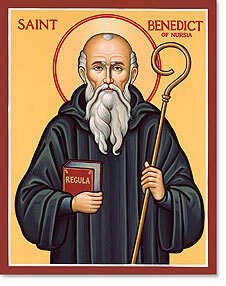 St Benedict, patron saint of Europe and students, was born the son of a nobleman in Nursia, Italy in about 480. Having turned his back on a rich life, he became a hermit and then founded twelve communities of monks. The Rule of St Benedict offered a way for ordering the life of the monks, telling them how to deal with all the things that they might come up against.